Learn what to do, and what not to do, to keep yourself safe when you operate CNC machinery. 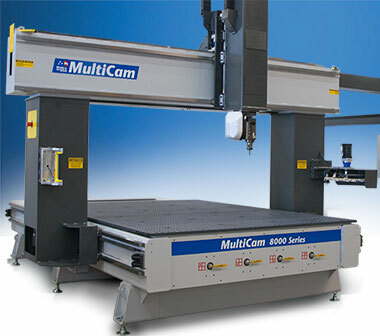 Computer numerical control (CNC) machines are generally safe. But worker misuse can easily jeopardize their safety. That’s why it’s important for their operators to know exactly what they should – and should not – do. Sounds obvious and simple, but some companies do allow untrained employees to operate CNC machinery with little or no training. Many accidents do happen this way. For some, it’s tempting to leave the room while the programmed CNC machine does its work. Most likely, nothing will go wrong. But once in a while, CNC machines break or don’t work right. It happens. They’re machines. And that’s when injuries can happen too. So make sure you have every CNC machine under observation by at least one person. Pretty simple and straightforward here. Never use blunt, cracked, or chipped tools. If you notice tools with damaged tips, don’t use those either. Before you operate a CNC router, make sure there aren’t any screws in the path of the bit. At best, the bit will get broken and the screw will get embedded into your project. However, in some cases the screw can shoot off and hit you or another worker. If, during operation, you notice anything unusual with the bit, hit the pause button, or the red emergency button for immediate shutdown. Fix the problem before you begin operating again. If you’re not feeling well and it’s hard for you to concentrate because of a sickness, don’t use CNC machinery. Supervisors, send your workers home if you notice them behaving unusually. Workers, notify your supervisors if something doesn’t seem right. Better to miss a few hours of work that cause an injury to yourself or someone else. And, better to leave work than it is to break the machine and cause costly repairs and downtime. Do those things – and you and your workers will stay safe. Thanks for sharing information about 6 Unbreakable Safety Rules for CNC Machinery Safety.